Rumi Foundation, especially its Lucknow Chapter has always been devoted to the promotion of culture and communication arts through festivals, symposiums, publications and films. The Foundation’s flagship event is the annual Wajid Ali Shah Festival which was recently organised in the city at Dilkusha Palace on 25th March. The festival has always been supported by U. P. Tourism right from its inception in 2013 and this year, it was inaugurated by Deputy CM Shri Dinesh Sharma and UP Tourism Minister Mrs. Rita Bahuguna Joshi. Envisioned and directed by renowned filmmaker, poet and painter Muzaffar Ali, the fifth edition of the festival was based on the theme ‘Yamuna – Dariya Prem Ka’. The musical depicted the story of the river Yamuna and its changing rhythms, the Rasleela of Krishna and his dalliance with the Gopis. 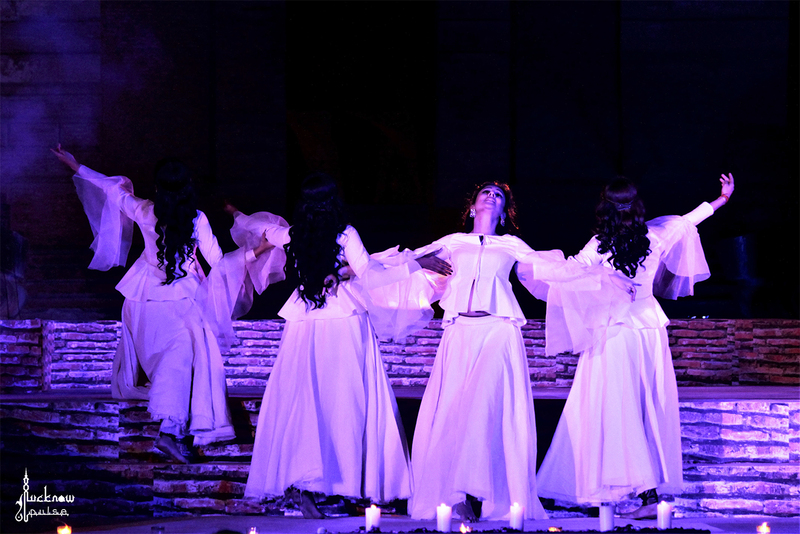 The dance ballet took the form of the classical dance Kathak to showcase how the journey of the river Yamuna has gone through so many upheavals – much like the life of a woman. The ballet was choreographed by Astha Dixit who also happened to be the lead dancer. The dance group also had Richa Joshi, Pallavi Basu, Henna Hayat, Sankriti Vashishtha, Mayukh Bhattacharyya, Zulfaqaar Umair among others. Besides enthralling the audience with the river’s journey, the musical also reflected upon the amalgamation of the Yamuna with Amir Khusrau who has sought Krishna from the river’s timeless position. The Yamuna was a part of Amir Khusrau’s life as Khusrau was a part of Yamuna’s. The river flowed and Khusrau contemplated on its banks on its changing rhythms. It gave him words to craft the spiritual beauty of the Beloved. Yamuna was the timekeeper of our history and Khusrau an iconic milestone. The evening not only captivated the art and music lovers with its visual magnificence but also gave them a rare glimpse into the river’s rhythmical journey. Next came up, Dastangoi by Sahil Agha, wherein he told a few anecdotes from the life of Nawab Wajid Ali Shah, the source of inspiration for the festival. Having found its place in the hearts of the people, the festival has become a huge attraction for locals and visitors alike who look forward to this event every year. It has made noteworthy contributions in promotion of the culture of Avadh and spreading the message of peace in society, besides promoting talent in various aspects of traditional dance and music.